Receibe it the tuesday 23 apr. NOTE: * You can later create your designs and watch a preview of your order. 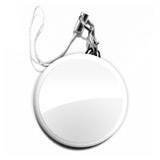 Key rings are a perfect promotional gift or for raising funds for any business, association or group since they are very useful products with a lot of possibilities for personalisation. Include a creative design with you company’s logo, your corporate information, your campaign slogan, your album cover art, etc. and get your message out to wherever you clients go. 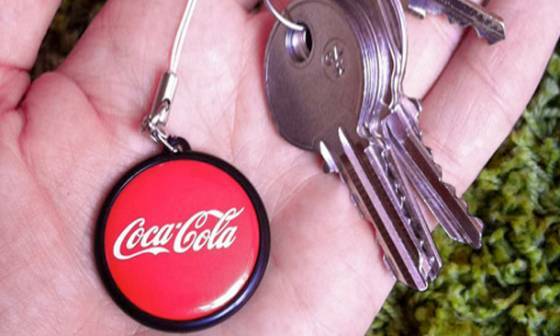 We always have our keys with use and everyone always needs a key ring. What’s more, our key rings are the perfect gift for different kind of events whether these are business events or personal events. BUSINESS EVENTS: These are normally used at trade fairs, conferences, seminars, etc. and we can include all of your company’s corporate information so that your customers or associates can always have your details, phone number, website, etc. to hand. PRIVATE EVENTS: One of the products of choice for weddings, first communions, birthdays, etc. An unforgettable souvenir from a very special day on which you can include a message of thanks, a photo, a drawing, etc. OTHER EVENTS: Often used at openings or anniversaries for bars, restaurants, hair salons, clothing stores, etc. 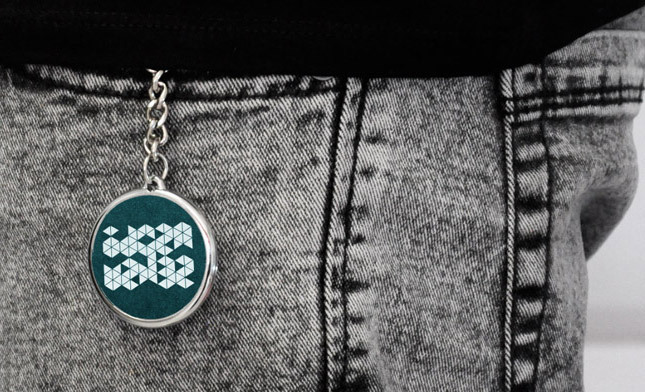 Personalised key rings from Pinspop are made of PVC and metal, which makes them resistant and last longer. What’s more, they are printed digitally in high definition in full colour, near-photographic, you can personalise them completely with the model, plastic coating and finishing that you use. BLACK KEY RING: Made in PVC with HD full-colour printing on the front and the back in black. WHITE KEY RING: Made in PVC with HD full-colour printing on the front and the back in white. METAL KEY RING: Made in PVC with HD full-colour printing on the front and the back with a metallic effect. With a metal ringlet and chain. DOUBLE-SIDED KEY RING: PVC key ring with silver effect rim and high-quality full-colour printing both on the front and back of the key ring. With a metal ringlet and chain. SPECIAL KEY RINGS WITH BOTTLE OPENER: Made in PVC with HD full-colour printing on the front and the back and completely customisable since you can choose between a selection of finishings. It also has a bottle opener on the back and a metal ringlet and chain. 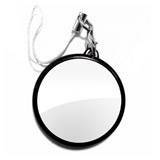 Round key ring high quality image on the front part and a metal bottle opener on the back with key ring and chain so that your customers can use it at their get-togethers and parties and always have your business’s corporate information to hand. Create customer loyalty while promoting your business! It is also a creative gift as a souvenir for any event that you hold. Print an original design on them, the date of the event, a photo, etc. and your guests will have a nice souvenir of your special day. 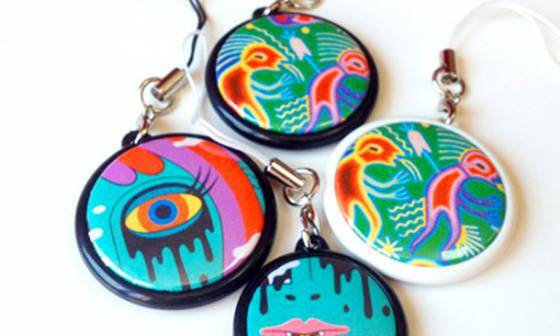 Colour: High-quality (near photographic) printing to make your key rings more intense. 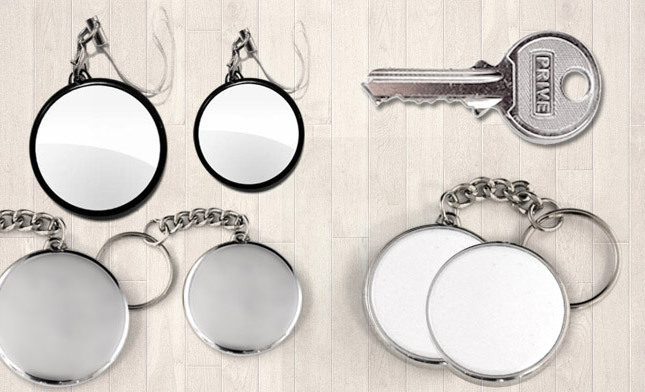 Black and White: If you want your key ring to be elegant, this is the finishing for you! 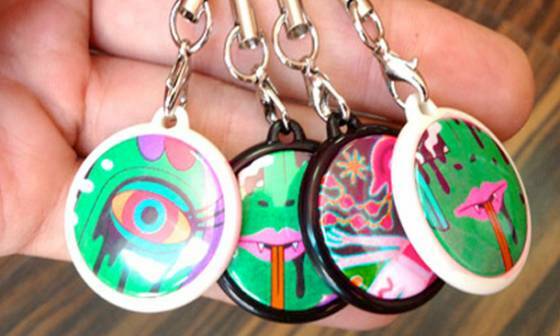 Fluorescent: Make your key ring stand out by choosing out yellow, orange, pink or green fluorescent finishings. Golden: We print your design on gold-coloured metal key rings (where there is a blank part the gold will show through). 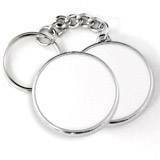 Metallic: We print your design on silver-coloured metal key ring (where there is a blank part the silver will show through). Shine: This type of plastic coating will give your key ring the shine you need. 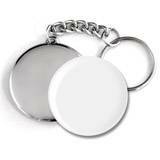 Matte: We get rid of the shine from your key ring to give it a little extra sophistication (colour printing on a white background). One of the most original finishings! Glass: One of the most original plastic coatings that we have at Pinspop. You can certain areas of your key ring an iridescent effect which will give them a different and fun flair. High-Quality Shine: Make the colours in your design more intense by printing your key rings on the extra-shiny plastic coating. We fulfill all your orders shipments up to 72 hours with the production included. Our service Express is the fastest in the market. 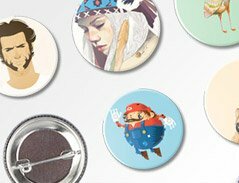 your custom badges on time. We're here to help with any questions you may have. In Pinspop offer a dedicated service to our customers because every customer is special to us. We use the latest technology in printing machines. HD quality in all our products. Your plates shall be finished and amazing resolution. Do not worry if something goes wrong. In Pinspop guarantee all our products and we are not responsible for any mishaps that may pop up. "Leaders across Europe in selling custom badges. We have over 7 years experience." You have selected fluorescent finish. Remember that you can not change the background color and that in this finish white does not exist. The white brightness of the image only part of the 3D simulation. They do not appear in print. For exact colors tell us your Pantone ® in the field of observations. You have chosen gold finish. Remember that in this finish color white does not exist. You have selected metallic finish. You have selected transparent vinyl. Remember that this vinyl color white does not exist. We add a little white edge 2mm. on the outside of your design. Remember that printing will start from the center of the cup. To enter text ordering from a computer. You have chosen fluorescent finish. You can not change the background color. Other formats may be loaded but not edited. Are you sure you want to discard all changes? The file is too large. Reducing weight or contact us. As you've seen, we are not an ordinary websit, we are much more than that. Our aim is simple, we want to be your personal factory dedicated to creating your items and personalized gifts. Pinspop consists of young, fun and dynamic people and our offices are in Extremadura. 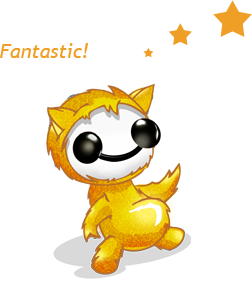 In 2007 we created Pinspop thanks to our training and our years of experience and ... we have many more years left! A fluid and immediate communication with the customer makes everything easier. 10:00 to 14: 00h. and 17:00 to 19: 00h. This is the most common and most used finish. Laminate and reinforce the print with a glossy protector. The matte finish is the most professional and beautiful finish. The printing is protected with a matt protector that eliminates all the gloss of the sheets and achieves a perfect effect. If you want your pins to shine brighter than ever this finish is perfect. We get the effect of glass and quartz with a 3D appearance of the print. This is the basic finish. Offset print on white paper 135gr. using digital printing high quality (2400x2400 dpi). We also use offset printing paper and our top quality but we remove the colour. This finish is fabulous! We have managed to provide a metallic effect to your designs. A spectacular gloss and appearance. It is very similar to our metallic finish, but we add a golden touch. If you want your pins or your keyrings or your custom magnets to draw some attention ... this is your finish! This type of finish and product is exclusive to PINSPOP. At Pinspop we work with two of the best shipping companies in Spain. Seur and MRW are the companies in charged of delivering our parcels. All orders arrive in perfect conitions, but if things go wrong do not worry, we will solve them quickly. We care about your parcels and your orders! Are you in a hurry to receive your parcel? Do not worry, at Pinspop we have a 24 hour Express delivery service (including production). To do so place your order before 13:00h. In addition, we offer an affordable service. Select the shipping that best suits your needs and do not forget that the delivery days start counting after we receive the payment in our account. You can use your Paypal account to make your payment. This is the quickest and easiest way. Access, and pay for your products in a quick and comfortable way. We'll begin with the production at once. Use your card to make the purchase. It is the safest and we'll verify your payment quickly. Card payments are made from our TPV. We will not save any of your data, the whole process is safe and private. You can also make your payment by bank transfer or deposit account. This got a bit slower. When you make the entry remember to send us the bank receipt to hello@pinspop.com. Best Deals: Thanks for signing up. You must enter your email and accept the Terms and Conditions of use. We are offline, leave a message and we will reply soon. Please review the fields in red.